A dyslexia specialist discusses the assistive technologies she uses to help students with dyslexia make gains in reading. I’m a dyslexia specialist, and I work to promote a growth mindset and establish an expectation of high achievement for all of my students, so I ask them every day, “What are you reading today?” A key strategy I use is having them read along with audiobooks, which is beneficial in tying their emotional belief system directly to their academic performance. 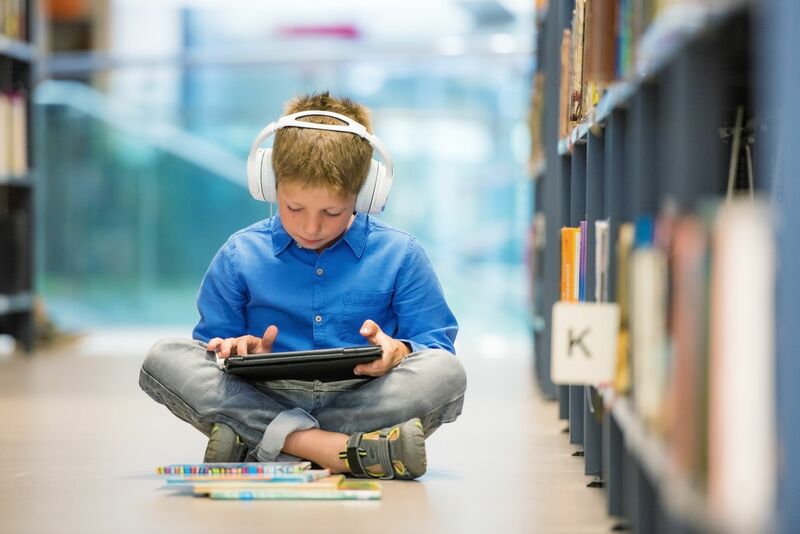 It’s important to allow students to choose books that match their interests, hopes, and dreams, and that is still true when working with audiobooks. For example, I had a student who came to me as a non-reader in second grade. Through conversation, I learned that he wanted to become a storm chaser when he grew up, so together we searched for nonfiction audiobooks related to tornados, tsunamis, and hurricanes. He went home and ear-read an entire book for the first time in his life. Overnight, his belief system about reading and books changed from avoidance to intense interest. Previously, he had thought of books as a form of torture because reading involved intense, laborious decoding that resulted in frustration. He hadn’t thought of books as a means to learn something new. He began using vocabulary he had heard while ear-reading high-interest books, and we continued to talk each day about what he was reading and added new books to his online bookshelf. A few months later, his mother emailed to tell me that his attitude toward school had changed. She was thrilled that he now wanted to go to school. This shift in attitude transformed his academic performance—he became engaged in school and took ownership of his learning, and his self-confidence began to blossom. Students who qualify as having dyslexia typically read below grade level but have the aptitude to become high achievers. For them, exposure to words in context via ear-reading can significantly reduce reading barriers, and human-narrated audiobooks really do make stories come alive for these students. Each day, I ask my students to ear-read for 20 minutes to strengthen their reading frequency, vocabulary, and stamina—a practice promoted by Daily Five and Learning Ally, a nonprofit education technology organization that provides schools with access to human-read audiobooks, textbooks, and literature. There are other companies and organizations that provide accessible books too, like Overdrive, Bookshare, and Audible. Other resources in my assistive technology toolbox are text-to-speech programs like Snap&Read and Natural Reader. My students have become celebrities around our district of more than 12,000 students because of their skill at using these types of software—we created the Student-Led Tech Crew, made up of students with dyslexia ages 9 to 17 who have become confident public speakers and presenters. The Student-Led Tech Crew travels around our district sharing their assistive technology toolboxes with other teachers and students. We were even booked to teach in our district’s professional development sessions prior to the 2018–19 school year. Most recently, we were invited to present our tools for academic success to a room full of district administrators, and my students handled these executives like pros. These students have made marked improvements in their reading skills and social behavior as a result of our structured literacy curriculum, my high expectations for their achievement, and their use of supplemental assistive technology resources. Through the structured literacy curriculum, I teach students to decode words in an explicit and systematic manner that focuses on phonology, sound-symbol association, syllable types, and syntax. In addition, this instruction is delivered in a multisensory way that is proven to build pathways to improve phonological memory. Used together, the curriculum and assistive technology support students, improving their performance through exposure to new vocabulary and daily access to grade-level texts. The biggest benefit is that students are recognized for reading and academic achievement—a rare occurrence for most students with dyslexia. Another moment of recognition came last year when we won third place in the nation in Learning Ally’s Great Reading Games, ear-reading over 134,000 pages in just seven weeks. The students were thrilled to be featured by our local news station. Students come to class each day and eagerly participate in my structured literacy lessons. They continue to choose audiobooks above their reading level to read at home, and they talk about books with their peers. They demonstrate, with authority, how to use technology to read audiobooks and to help them read unfamiliar words on websites or PDFs. As a result, they’re now asking their classmates, “What are you reading?” with confidence. I’ve also noticed emotional gains in my struggling readers, such as perseverance and independence. The effective use of assistive technology coupled with an explicit structured literacy curriculum can be life-changing for students with learning differences. Try one of these tools to see if your students will come out of their shell. Give them the freedom to choose what topics they want to learn about and watch the transformation in their self-belief that they can be successful readers and achievers.